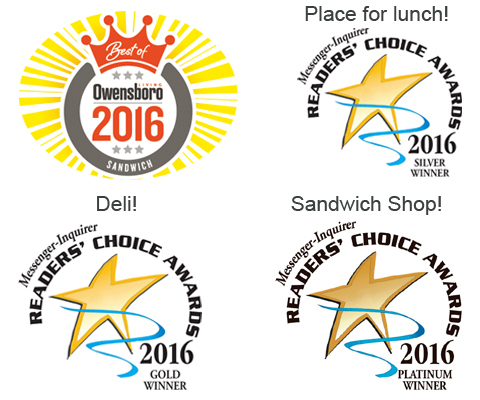 Your Local Bakery in Owensboro, KY | Great Harvest Bread Co.
We are proud to announce three 2016 Reader’s Choice Awards from the Messenger-Inquirer - Platinum Sandwich Shop – Gold Deli – Silver Place for Lunch. Along with the 2016 Owensboro Living’s Best Sandwich, we are grateful to our dedicated employees and our wonderful, loyal customers. In front of Lake Forest subdivision on Hwy. 54. We have new exciting offerings like - savory biscuits, made-to-order salads & Peet’s Coffee, Cappuccinos, Lattes, Mochas & Macchiato - Hot & Iced. We have seating for 70 plus an outside patio. Free Wi-Fi hot spot. YOUR Neighborhood Café Bakery & Much MORE! And the awards keep coming!! !